Secretary of State Rex Tillerson almost resigned over the summer around the time of President Trump's controversial speech at the Boy Scouts' Jamboree, according to an NBC News report. 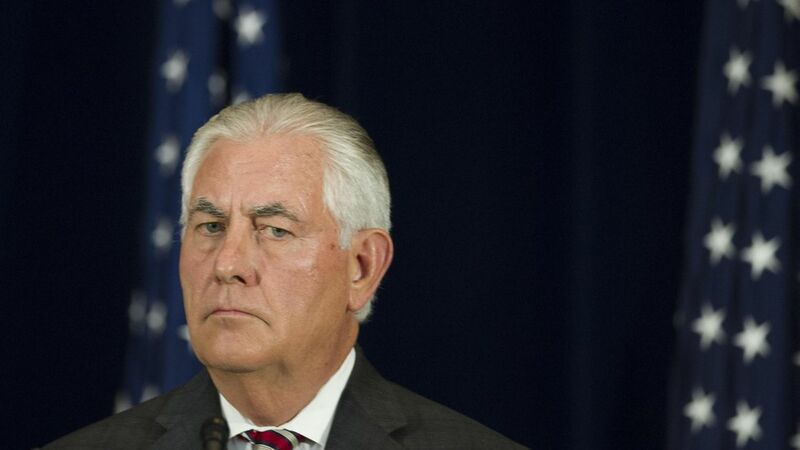 Tillerson also reportedly called Trump a "f***ing moron" following a national security meeting at the Pentagon in July, as NBC News' Stephanie Ruhle told Hugh Hewitt. Tillerson's spokesman at the State Department flatly denied the report. Why it matters: Tillerson reached that point after months of foreign policy disputes with Trump, specifically on Iran and Qatar. It reportedly took personal interventions from Vice President Mike Pence, Secretary of Defense Jim Mattis, and then-Secretary of Homeland Security John Kelly to get Tillerson to reconsider. But there's again trouble in paradise: Trump used Twitter to very publicly undercut Tillerson's North Korea strategy over the weekend. Worth noting: Tillerson's spokesman told NBC News that the only time Tillerson and Pence ever discussed something other than policy was a meeting where Pence asked Tillerson if he thought U.N. Ambassador Nikki Haley was helpful to the administration. Haley is widely viewed as coveting Tillerson's position, which she has flatly denied. Go deeper: Axios' Jonathan Swan details how Tillerson has become isolated from nearly everyone.